The famous last words of a business owner who did damage to their brand by assuming “young people” must know online marketing and social media. Do you remember the sad story of James Foley? The poor guy who was beheaded by ISIS in 2014 on camera? 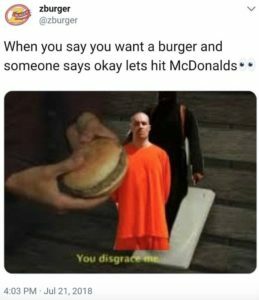 This story made news again when a social media company hired by a local burger chain to “manage social media” created a post with a picture of Foley right before he was murdered. So… you can see the stupidity, I pasted the image in this email. Marketing, Your Website, Facebook, Instagram, Google… To use these channels properly you mustn’t forget the core mission… You are using these platforms to sell your stuff/services. It’s not so much about being clever or cute… or worse… distasteful. It’s about business experience and selling. In the past I have always advised to proceed with caution if you’re considering delegating social media to an outside firm. Defiantly one reason I keep our social media services to a minimum… advising when it comes to Facebook and Facebook Ads and strategically posting on Google My Business to drive search results.